Footprints Accountancy are an established firm who have been delivering accountancy and business advice services to businesses throughout South Yorkshire, Derbyshire and North Nottinghamshire for the last 8 years. The company recently moved to new premises at Barlborough Links, which not only provided them with more capacity to grow but also facilitated the launch of new sister company Footprints Training and Growth. The new company will provide much-needed training for businesses in financial management, business growth and online accounting. With the onset of ‘Making Tax Digital,’ it is now even more important for businesses to keep on top of tracking their finances. 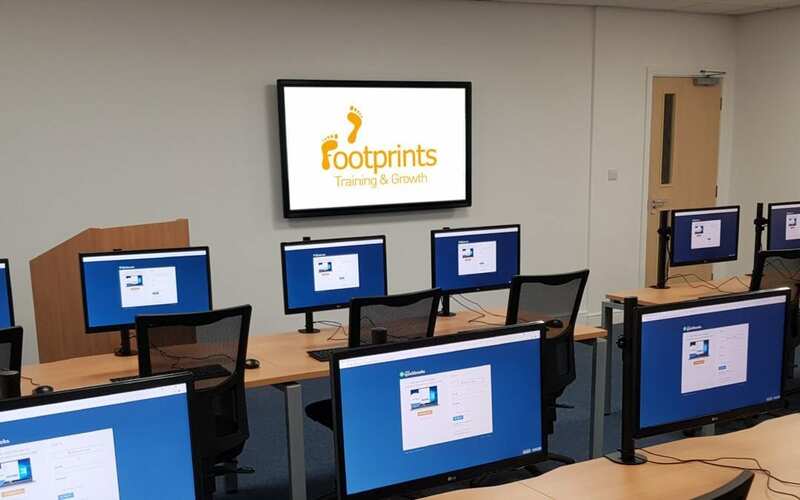 Footprints have invested in a purpose built, fully equipped IT training suite at its new offices with dedicated software for specialist financial training. This will be used for Footprints own training as well as being available to hire for other businesses who want to make use of the facility for their own commercial or in-house training. Some sources suggest that cash flow issues and poor financial management could be responsible for up to 90% of business failures. If you want to succeed in business it is therefore vital that you stay in control of your accounts and manage your cash flow, budgets and taxes properly. As a Platinum Quickbooks Partner for Intuit UK, Footprints provide expert advice to their customers to help them use best practices and online tools to manage their business finances effectively. Director Julie Robinson, a former bank manager and company finance director is a certified Intuit QuickBooks trainer, part of a global elite of only 200 certified trainers, ten of which are based in the UK. In this role, Julie trains other accountants on the core and advanced accredited training courses. Julie and her team are now offering their own customised QuickBooks for Business course which has been developed to include the key aspects that businesses need to know to properly manage their accounts. The one day course is available to book now on Footprints website and places are in high demand. Customers who attended the first ever course which took place in January loved the new facilities and found the training exceptionally helpful to their businesses. I attended the training for Quickbooks with Footprints accountancy, Great, easy to follow training, giving you a good understanding of how easy it is to use, and how much you can do and see on there about your business. It is updated regularly, helpdesk available when you need it. Have decided to go on and use for our Business. If you want more in-depth help, a Footprints QuickBooks trainer can also come to your business for the day and give you one to one targeted help in the areas that matter to you. This personalised, innovative service allows you to choose what your day looks like, ensuring you get the most value for your business. Whether you need a helping hand setting up, or need more in-depth support and advice, their experts will explain things in a language you can understand, giving you the confidence to move forward with your QuickBooks Online software and the skills to manage the financial needs of your business. or give the team call on 0114 248 8764.